In the framework of the creation of the Network for integrity and on the occasion of the International anticorruption day, on 9 December 2016, the World Bank delivered a panorama of financial disclosure policies in more than 160 countries to the 14 founding members of the Network. 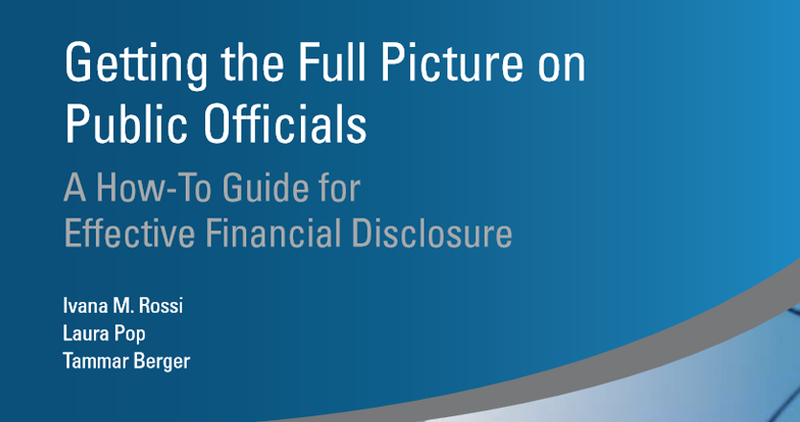 Ms. Ivana Rossi, senior financial sector specialist, presented for the first time, on the day of its official launch, the new publication of the World Bank: “Getting the Full Picture on Public Officials: A How-To-Guide for Effective Financial Disclosure”. When this project started in 2007, the facts were simple: 161 countries had financial disclosure mechanisms but the vast majority was not fully implemented. The World Bank highlights that there were few guidelines and support at the time for countries trying to implement such regulations and few opportunities and forums to discuss these topics. Today, the publication of this guide echoes the evolutions on this topic over the last few year: it has attracted more visibility in the media, and benefits from increasing attention in international policy dialogue. The guide is structured upon two sets of data: the data resulting from the laws in 176 countries and the data from the implementation of such laws in 52 countries. They allow the authors to draw conclusions, to identify key challenges across regions of the world and to provide guidance on how to better implement such mechanisms considering the legal, socioeconomic and historic context of the considered country. After the presentation, the discussions with the members of the Network for integrity highlighted the importance of the World Bank resources, especially its Law Library, for the future activities of the Network. Participants also returned to the topic of illicit enrichment as a tool to fight corruption and on the impact of culture in the different countries, notably facing the absence or almost total absence of disclosure disposals in countries that are considered the least corrupted ones in the corruption perception indexes.